You are here: Home / Mark Your Calendars …Today, I Lost It. Mark Your Calendars …Today, I Lost It. During every long renovation, every renovation of something major, there comes a time when it’s been TOO long. When the dust and the mess and the lack of running water in the kitchen finally gets to you. When you cannot possibly eat out one. more. night. Well, for me, that day was today. It started out as a perfectly wonderful day. First day of school for my kids, and I got to see and visit with old friends up at the school. Then I walked home and my knee felt pretty good. Then I went to work. So far, so good. …was making some G-d-awful noise. Like a noise that a five-day-old fridge should definitely not be making. My contractor said I needed to call for service and explained what he thought it was. Annoyed, I called the Kitchen Aid service line. They are coming out Wednesday, which is good, although I’ll either be in a meeting or picking up kids or dealing with screaming kids when they come. Grrrr. Then I learn that the fridge still isn’t hooked up to the water supply because of a problem with the lines. The contractor called the plumber, who never called back. So, not only is the fridge making some sound like Wile E. Coyote with a small jackhammer in the back of the fridge, but it also can’t give us ice and water yet. Add to this several other minor annoyances going on (washing dishes in the bathroom sink, e.g. ), and I just couldn’t deal anymore. I had hit my limit. That was it. It was time to have the tantrum that all sane people who live through a renovation have. OK, it wasn’t a full-fledged tantrum. It was more like a mini-tantrum, although I might have jumped up and down a couple of times. My super-duper contractor and I went over his to-do list, because as you know from this post, I don’t like chaos and I love to-do lists. Luckily, he understands this. 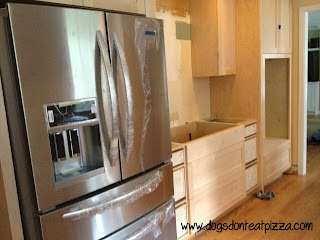 We went over ALL the things he can be doing in the meantime before the countertops arrive. And he gave me times and days on which he’s going to try to get those things done. That’s how I felt today. I needed to know when things were going to get done. I felt like things were happening – my wonderful contractor is working as best he can – but things weren’t getting finished. I want to be finished now. I hit the breaking point. And then we went out to dinner. Sigh. This renovation will be done soon. I am so lucky to be able to renovate our kitchen, let alone end up with the gorgeous, useful, amazing kitchen that we will eventually end up with. Just sometimes I get woolly weary (I hate it when people get the words wrong). Tomorrow, I am working from home. I am going to use that time to do some much-needed work, but also to complete a few lingering projects. Getting something crossed off my list will feel good, and maybe counteract the weariness from the kitchen renovation. 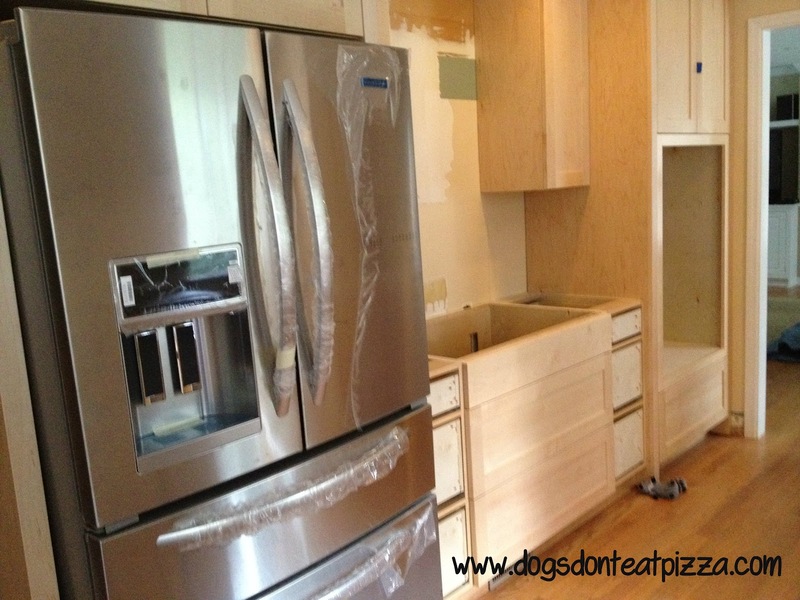 How have you dealt with a long renovation or project? How did you stay sane? We all get woolly now and then. Tidy up whatever you need to tomorrow, then find some small project that will be simple yet satisfying. That may soothe the savage kitchenless beast. Yes, you’re right. As I type, I am in the middle of hanging up my new dry-erase calendars and bulletin board in the breakfast room. If I can get this all up before I collapse, I will feel better for sure (although, really, really, I need to go to bed). Thank you. Oh I know it is so hard! Try to hang in there. And make sure that water is hooked up right. Our new LG was a dud. I won’t tell you my horror story but please make sure and document every call you make and all the problems. Shannon, That is so true. I did document everything…and there was a horror story that happened after the service person came out, too. I won’t get into it, except to say that Lowe’s was wonderful and the manager there ordered me a new fridge, and apologized profusely for what happened. I’m sorry you had a horror story, too. Sorry it was so hard for you to leave a comment. I’ll fix it. Thank you for sticking with it and posting! Glad to have you. I’ve read your blog and love it. Thanks! I know not of these “to do lists” of which you speak. (read that in your best foreign accent) If I made a list I would forget where it was. Don’t have tantrums often, but the last time i did I hit my dining room table and a big hunk of it broke off! Please don’t tell anyone…. oh, and hang in there. Your kitchen will get finished. Thanks! Wow – you must have been PRRRETTY mad to break your table! Your secret is safe with me. Thanks for the encouraging words!